Nonfiction Essay By Lynda McKinney Lambert: "A January State of Mind"
Lynda McKinney Lambert created a collection of poems, reflections, and short essays in the book, “Concerti, Psalms for the Pilgrimage, “ published by Kota Press. Her writing research and unique projects have been published in 2 books by Terry White, Professor of English, Kent State University. Lambert is a retired Professor of Fine Arts and Humanities, Geneva College, Beaver Falls, PA since 2008. She is currently working on two books for publication in 2016 – one is a book of poetry, the other is a collection of short essays by Lambert. Her writing appears in numerous literary journals and magazines. Lynda lives with her husband Bob, 4 rescued cats and 2 rescued dogs. She likes to knit for charity, when she is not working on her art or writing projects. Lynda Lambert lost most of her eyesight in 2008 due to Ischemic Optic Neuropathy, a rare condition that brings sight loss, without warning and there is no know treatment for this condition. Lynda has a BFA in Painting from Slippery Rock U of PA; MA in English Literature, Slippery Rock U of PA; and MFA in Painting at West Virginia University. January is a confusing month! Do you feel stretched in two different directions? It’s strange because I feel like I am two different persons. One is the public image, the forward-looking face I wear most of the time. She is the go-getter, high achiever, a bold, fearless professional woman. Yet, at other times, you can see the other face, another “me.” She is often unusually quiet, private, occasionally uncertain, aloof at times and not always much of a group person. This brings me to a deeper question. "Do we experience feelings of duality because January is on our minds? I do have these mixed and competing feelings in January every year. Do you? Here is how to get a clue into your own experiences in January. Scanned back through your own previous January entries in your journals? You know, the ones you wrote in past years? January is a great month for reflection. January is a state of mind. I feel like I am doing a circular dance of duality. It must be the two sides of me. There’s something hidden deep inside of us that makes us restless, uncertain, and hesitant, in spite of all our best efforts to make changes for the year ahead. Is it possible that while we are looking forward for the new horizons in our life, at the same time, we are looking backwards? Perhaps. In January, we can gain wisdom and reconnect with something spectacular that we missed when we were too close to it to really see it! The ancient Romans named the months in their year after the gods. They had only ten months in their year, and did not have the two months we know as January (Januarius) and February (Februarius). These two months were added to the Roman year circa 700 BCE. January was named after the Roman god, Janus. Unlike our calendar today, January was not the first month of the Roman year until after Numa Pompilius, the second king of Rome, changed the sequence of the months into the twelve month calendar. Because an odd number was considered to be “lucky” the king changed the number of days in several months from the unlucky even numbers, to the lucky odd numbers. Long after this change from a ten-month to a twelve-month calendar, the Emperor Julius Caesar, would make additional changes. After 46 BCE, February was designated to be a “Leap Year” and additional changes were made. Instead of the “Roman Calendar,” it was now called the “Julian Calendar. Maybe the dual feelings we are having on this first month of the year is because it is named in honor of Janus. Naming is so important. Our name has helped us to develop into the person we are today even though we were unaware of that most of the time. Experts recommend that families carefully consider what they will name an unborn child. They caution us to choose a name that will be a positive influence on a child because the child will grow into the various aspects of the name’s meaning. I often pause to be grateful to my parents for giving me a name that means, “beautiful.” It makes me smile every time I think of it. My name reminds me to live up to it’s meaning. In mythology, the pantheon of gods and goddesses have different functions or jobs. Janus is the god who guards and controls gates and doorways. I envision his job to be the one who orchestrates migrations and journeys.. 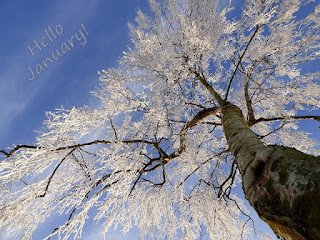 I am thinking of January as a doorway or gate into a new beginning with fresh, exciting expectations. January is a gateway to pass through, into our new beginning. My personal insight for this new year indicates that I plan on some type of travel, or movement through a passage. But, each of us will travel from one place to another in the next year. It’s an inner voyage or personal transfer of some sort. It’s only natural that we would feel conflict as we realize the impact of January and how the days of the month might affect us. Like Janus, I often think of a passage from one place, left behind, to the new place, just ahead of me. I searched for those pathways in my poems, journal entries, and dreams. I see this theme developing as I write about being in one place, yet, longing to go to another place, or to go back to where I once was. My view of my own life-journey is a pilgrimage – and I believe we can all see different kinds of personal journeys in our recollections. Janus holds the answer to this inquiry, too! January is the festival month for Janus. He stands in the doorway. But, the problem is that Janus has two faces! Simultaneously, he looks forward through the doorway, to the passage ahead with one of his faces; the other face looks backwards. One face to the front. One face to the back! Here is the dual message that we encounter! Is it any wonder we feel so uncertain in January? Sometimes we don’t know if we are coming, or going, through Janus’ passageway. While we want to go forward, another part of us looks backwards. I seem to step right into Janus’ vision myself. I look forward, forge my intentions into a pathway for the new year. But, what I feel rumbling inside of my being, is the reminders of a backwards step at the same time. Why don’t we recognize, or put into language, what we really experience, internally, in January? Is it because the noisy crowd drowns out our inner life and our inner feelings, our intuition, and our internal voice as they shout out “Happy New Year?” We have been told this is the time for our expectations to be declared and realized – yet, there is that other side of Janus, in our mind. As we ride the crest of January, the pinnacle of the new year, we have expectations for what we believe the new year holds for us. Those are the thoughts we talk about with others. Here is what we often do not speak about, though. It’s just too hard to put into words sometimes because it’s painful. We have an "inner critic," an unseen voice reminding us of past failures, deflated expectations, short-comings, blunders, and more. That is the other side of Janus! Oh, we fail to understand this side, and we sure don’t want to be talking about it to anyone. We have to keep up the smile; keep up with expectations. We have to…..you fill in the blanks here. It does not take much of a leap to see the self-centered, secular expectations of our contemporary culture. The “New Year” resolutions madness can literally paralyse any thing creative, inspired, spiritual, artistic, resourceful, inventive, imaginative, intuitive, innovative, and productive on the inside of us. The Janus mask is carefully in place for so many people who will never experience inner peace and joy because they are running so fast in a direction that will lead them to emptiness, after all. But here’s the dichotomy of it. Stop and be quiet for a little while. Maybe get up early tomorrow morning, when the house is still. Spend fifteen minutes in silence. Keep your thoughts focused on getting in touch with your purpose in life. In a quiet time, we can turn off the loud voices that distract us so easily and cause us to be confused. Contemporary culture informs us to be determined to do what we want to do - push our way to the top of whatever we decide to do. The clamering voices are loud and demanding, often brightly colored, cut-out images of what we should look like and how we should think. They shout to us about how strong we are, how we can do anything we want to do- call ourselves powerful and smart. Oh, but wait a minute! Stop for a moment; listen for the gentle whisper of your inner being. Listen. We can look forward with expectations that are grounded in divine purpose for our life. I recommend a look back because it is wholesome for us to do. History bears fruit, you know. We bear fruit as we discipline our mind to study history. Our life’s personal story is like a display of artworks on a gallery wall. The images are displayed. If we are careful and honest when we look at the pictures of our own thoughts, we’ll find some gems as well as some clinkers. Both are good for us to consider because they all show us the path we are on. January, after all, is a state of mind.